Harvard’s Title IX Office will split into two distinct offices in an administrative restructuring that formally separates administrators who investigate sexual assault complaints from those who provide Title IX training and resources. Nearly three months after the departure of former Title IX Officer Mia Karvonides, the University announced Wednesday that Deputy Title IX Officer Nicole M. Merhill will replace her. But unlike the role Karvonides played as Title IX Officer, Merhill will not oversee investigations. Instead, Bill D. McCants, who has served as the acting Title IX Officer since Karvonides’s departure in January, will oversee investigations as the director of the newly-created Office of Dispute Resolution, which replaces the Office of Sexual and Gender-Based Dispute Resolution. Merhill’s office will focus primarily on “proactive” training initiatives and providing support for those who have experienced sexual assault, Merhill said in an interview. 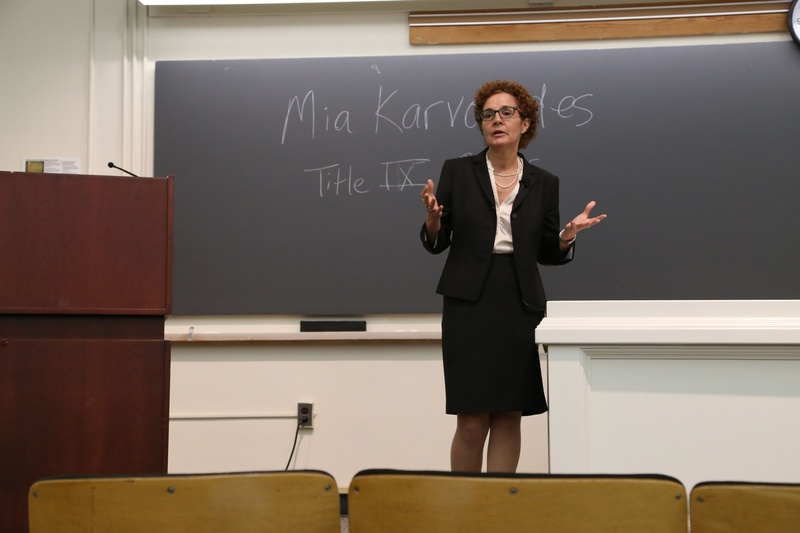 Former University Title IX Officer Mia Karvonides, pictured here at a Title IX policy meeting in 2015, left Harvard in January. The University has also hired Julia Sáenz, formerly a Title IX Associate, to fill a new position of Assistant Title IX Officer. The “paired” offices will share the same space and an administrative aide, and both will report to Deputy Provost Peggy E. Newell. The administrative changes come three years after the Title IX Office was first created in 2014. Initially understaffed, the office—tasked with handling sexual assault complaints from across the University—faced difficulties managing a growing caseload. Karvonides established a pipeline program to grow the office, and helped develop a new University-wide Title IX policy and set of procedures. “This is a change being made in response to feedback from the community and a desire to enable the Title IX Office to expand its menu of trainings and educational opportunities across the University,” Newell said in a statement. Newell talked to administrators and groups involved in sexual assault prevention and response efforts across the University before devising the new structure. McCants said some felt that under the previous system, the responsibility for prevention and adjudication fell too heavily upon the lone Title IX Officer. McCants said dividing Title IX responsibilities between two offices creates a degree of distance between the support and investigative functions of Title IX administrators. “It just means that the Title IX Officer will no longer be directly involved in investigations,” McCants said. Previously, the Title IX Officer was responsible both for working to provide interim accommodations and resources to people who had experienced sexual assault and investigating formal complaints, sometimes performing both roles for the same individual cases. “Now, that won’t be a concern,” McCants said. McCants will supervise ODR in investigating and adjudicating Title IX complaints, although Merhill will still select faculty and senior administrators to hear appeals of the results of those investigations. The Title IX Office will handle informal resolutions and provide interim support to people who have experienced sexual assault, in addition to developing educational programming. “I don’t think there is a huge shift from Mia’s work to the work I will be doing as a Title IX officer; rather, it’s continuing the good work of this office and really staying focused on our mission of ensuring gender equity,” Merhill said. Merhill said her top priority as she assumes her new role is collaborating with groups across the University, including the Office of Sexual Assault Prevention and Response and student organizations. Coordination across schools poses a perennial challenge for Harvard’s central administrators, particularly in the realm of sexual assault prevention. A University task force released a report last year outlining a set of recommendations for sexual assault prevention measures, and a year later, schools have made uneven progress in implementing these. Merhill said her office will work to develop online training modules for each of Harvard’s schools, as well as an online module for staff, by July 1. McCants, meanwhile, said he will focus on investigating Title IX complaints and may develop ODR as a resource for civil rights issues beyond Title IX. Both civil rights attorneys, Merhill and McCants worked together at the U.S. Department of Education Office for Civil Rights before coming to Harvard. McCants became a Deputy Title IX Officer in 2014, and Merhill arrived in 2016.